Lotus Blossoms dancers have gone past basic training of Kuchipudi and immersed into the challenges of Kuchipudi dance as a performing art by exploring into it's kinetic and philosophical aspects. Once the dancer has completed three stages of Lotus Buds they move on to the five levels of Lotus Blossoms. Benediction of ankle bells by guru. Entering the shrine of dance. Offering at the alter of dance. Attaining the gift of dance. Illuminated by the grace of dance. Nritya Prakash "Illuminated by the grace of dance" is a stage when the dancer has completed the full classical repertoire. 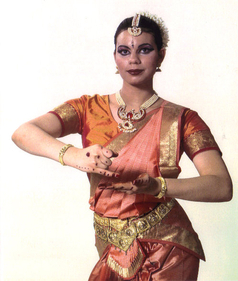 The Nritya Prakesh enables the dancer to render a full length (90min) solo concert refered to as the "Ranga Pravesh" and reconized as a public debut. Thus these dancers cross the threshold of practise into challenging, exciting, performance oppurtunities with the Devi Dance Theater.